Dubai, 28 April, 2018: Dubai Women Establishment (DWE) has successfully concluded the second edition of its Innovative Leaders Program, hosted in collaboration with the distinguished Ashridge-Hult International Business School in the United Kingdom. The program was launched in 2017 under the patronage of Her Highness Sheikha Manal bint Mohammed bin Rashid Al Maktoum, President of DWE and wife of His Highness Sheikh Mansour bin Zayed Al Nahyan, UAE Deputy Prime Minister and Minister of Presidential Affairs. 16 female prominent Emirati leaders have completed the program, which was developed to support the UAE’s vision of fostering a culture of innovation across the country, by helping women to transform their leadership approach through experimental and out-of-the-box thinking. The eight-day program followed an interactive learning process – learn, disrupt, apply and integrate, through insight sessions, guest speaker presentations, organisational visits, strategic challenge projects, coaching and networking. The four key themes of the program included agile disruptive innovation leadership, creating a culture of experimentation, leading disruptive innovation processes and decision-making at pace in uncertainty. 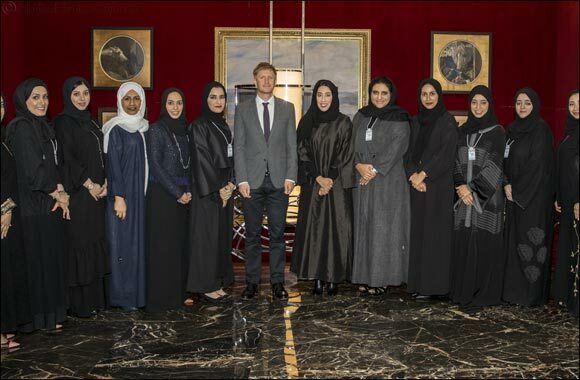 The program was concluded with a ‘closing circle’ session attended by HE Mona Al Marri, Chairperson of the Board of DWE, Bjorn Bengtsson, President of Ashridge Executive Education Business School, and Sultana Saif, Corporate Director of Development and Research at DWE. HH Sheikha Manal, highlighted that the UAE has made truly remarkable strides in strengthening the influence of women and their contribution to society. Today, Emirati women are highly educated, skilled and empowered partners in the development of our nation and its continued prosperity, and have the opportunities they need to grow and succeed. This is thanks to the continuous support they receive from the UAE’s wise leadership, who are committed to ensuring that Emirati women have the necessary tools to excel across all sectors and take on decision-making positions. During the program, participants also met with innovative thinkers of renowned businesses and leading government bodies, attended sessions with expert speakers from academic, as well as public and private sector organisations, and were introduced to the practical skills and hands-on experience needed to lead disruptive innovation in their own organisations and fields. The program also featured a unique leadership simulation exercise designed to develop the agile leadership capabilities required to successfully lead disruptive innovation initiatives, through experiencing and handling a range of challenging dilemmas. The 16 participants also created personal development plans during one-to-one coaching sessions after the program concluded. During the program, participants visited five organisations renowned for their innovative approach, including Google, Her Majesty’s (HM) Revenue and Customs, RocketSpace, Salesforce and Wayra. They also went on a guided tour of the UK Parliament in London. Throughout these visits, participants attended workshops which served as a platform for discussion and interaction, and analysed case studies on the latest technologies and innovative approaches. The visit to Google provided participants with insights into how to scale a culture of innovation and experimentation, the role that culture plays in sustaining innovation, and the Google X/Alphabet model of exponential innovation. The visit also allowed the participants to learn more about the fundamentals of artificial intelligence (AI) and the blockchain technology. RocketSpace is a global ecosystem of people and ideas that helps the world’s top innovators bring the future to market. During the visit, program participants were engaged in sessions exploring how disruptive innovation thrives, what it takes to create an innovation ecosystem and lessons in leading innovation. Emma Mulqueeny OBE, founder of Rewired State and Young Rewired State, a Commissioner for the Speaker’s Commission on Digital Democracy and a Google Fellow, also delivered a session about leading disruptive innovation processes, from a commercial, government and start-up perspective. HM Revenue and Customs is a non-ministerial department of the UK Government, responsible for the collection of taxes, the payment of some forms of state support and the administration of other regulatory regimes. The visit allowed participants to learn more about leading large-scale innovation, digital transformation and the use of innovative technologies in government service design. Salesforce is a cloud-based technology company and the leading provider of customer relationship management (CRM) services around the world. Participants were engaged through sessions about how to lead innovation at scale and sustain innovation, as well as market-changing technologies and how organisations use them for successful innovation. Wayra is the innovation accelerator lab of Telefonica. The organisation supports startups and new technologies. During the visit, participants learnt about how a large organisation fosters innovation, and how established organisations can support and take advantage of startup technologies and processes. The program participants included Eman Mohammed Ahmed Al Suwaidi, Director of Dubai The Model Centre of the General Secretariat of the Executive Council; Manal Omran Taryam Al Shamsi, CEO of Primary Health Care Service Sector at Dubai Health Authority; Maitha Mohammed Aal Malek, Senior Director of Fixed Enterprise Business at DU; Awatif Rashid Al Suwaidi, Manager of the department of Artificial Intelligence at Dubai Police; Sawsan Mohammed, Director of Program Planning and Control at DU; Laila Mohammed Al Jassim, Director of Knowledge Management & Creativity at Dubai Economy Department; Maitha Shuaib, Director of Corporate Communication at Dubai Women Establishment; Nada Jasim, Deputy Director and Senior Manager of Corporate HSE Policies & Planning at the Roads and Transport Authority (RTA); Hamda Jasim Al Ghass, Deputy Manager of Financial Resources Department at the Ministry of Human Resources and Emiratization (MOHRE); Anoud Ahmed Ali Al Saadi; President of the Women's Police Council at Dubai Police; Sarah Adel Luqman, Manager of Sustainable Cities Marketing at Masdar; Noura Salim Al Mazrouei, Head of Public Relations at the General Directorate of Residency and Foreigners’ Affairs; Shaikha Ali bin Qedad Al Mheiri, Manager of Corporate Communications at the Federal Authority of Nuclear Regulation; Aysha Al Aydaroos, Manager of Business Support at Masdar; Amira Al Adwani, Manager of Finance Processes, Systems and Policie at Masdar; and Ayesha Ahmed Lootah, Director of Master Planning and Infrastructure at Nakheel. Established over 700 years ago, Ashridge has a colourful history, as a monastery, a family home which has counted members of the British Royal family as its owners, a college for politicians, a wartime hospital, a finishing school and most recently, a world-renowned business school. Ashridge has contributed to the success of thousands of individuals, teams and organisations by helping to develop their leadership capabilities. As part of Hult International Business School, one of the world's truly global business schools, Ashridge has an unrivalled international platform to deliver teaching across the globe. Ashridge Executive Education attracts clients from every continent and is in the 1% of providers globally to be accredited by all three major executive education bodies: AACSB, EQUIS and AMBA.